Sometimes you read a book and certain words resonate on the spot. You’re nodding your head and saying your Ah-ha’s and soaking in all the author offers. Every once and a while, you discover a word, phrase or story from that book comes back and re-gifts you at a much more needed time. 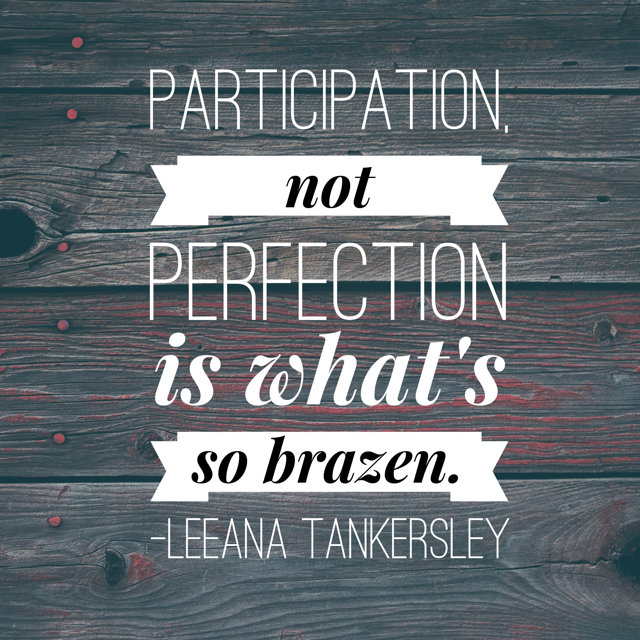 This phrase from Leeana Tankersley‘s book, Brazen, has been running on repeat in my mind as of recently. I have not written much since London was born. I gave myself permission to adjust and fully enjoy the first three months with her joining our family. Then, just as I began to envision and prepare myself for diving back into the writing, our two-year old broke her femur. Yes, her femur. Three weeks in a full leg cast, a traveling husband, a three month old, two elementary school kids wanting/needing stimulation on summer break and it literally took ALL of my time and energy to keep my four tiny humans alive and well. So goes life, right? As I sat down to write this past week, I was a little jaw-dropped when I looked at my blank computer screen. Nothing. Nothing came. The few sentences I did manage felt awkward, jumbled and about as far away from being considered eloquent or beautiful as is humanly possible. The creative-well seemingly dried up when I pushed out a baby and I wish I could say I was calm about my disastrous writing session. Instead my inner-artist nearly jumped off a cliff. “That’s it. The gig’s up. I KNEW I wasn’t a real writer. I KNEW it was silly to start writing a manuscript. Dear Lord. At least people are spared from reading such a horrific piece of work. At least I won’t be embarrassed if I end the project now.” (My inner-artist can be highly dramatic. Geesh.). This means showing up and offering what you have. This means doing the thing God’s inviting you to do. This means keeping one hand in the art, even if the other is nowhere to be found. This means taking the strangle-hold of fear off your own neck so you can actually breath. Participate. Even when doing the thing you were created to do feels hard. Participate. Even when your self-doubt runs deep and your fear runs high. Participate. Even when the world seems against you and it feels plain hard. Participate. Even when people say your offering is unacceptable. Participate. Even if you’re called the amateur, the under-dog or the nobody. Participate. Even if what you offer is far from perfect. But what if we were to LET GO just a little bit more? What if we showed up and let go? And what if we did this over and over again? Let’s show up. Create our art. Write our words. Join that group. Start that dream. Sit with our child. Lead those people. Take that class. It seems to me we’d string together a thousand imperfect words, brush strokes or actions and eventually – eventually – we’d step back and see what we would have missed had we not participated. So today I’m putting a little skin in the game. I’m going to show up and not hide my heart away. I’m going to participate and not expect perfection. 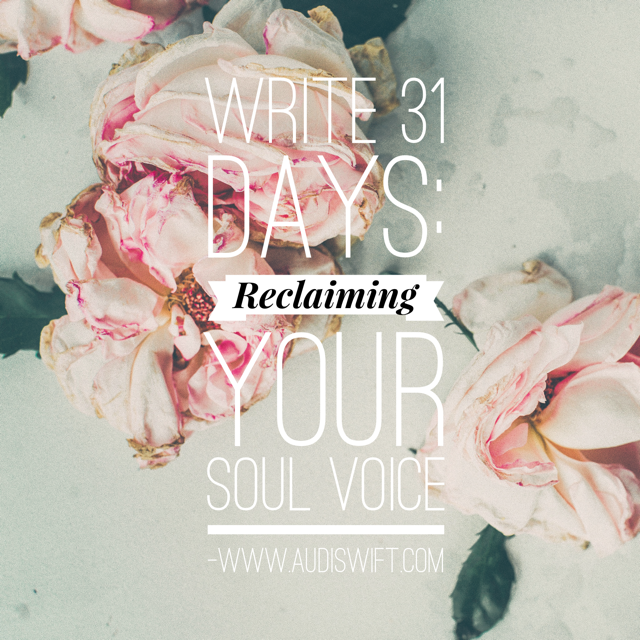 One way I am choosing to participate is by joining the Write 31 Days challenge of blogging every day in October. I am choosing to write through some of the pieces of my manuscript in progress… How God took me on a journey of healing deep wounds from a life-time of shame, learning self-compassion and ultimately reclaiming my Soul voice. I hope you’ll follow along and find some encouragement as I send my offerings out into the world. How can you show up and participate in your life today? I understand… Let’s just keep showing up and doing what we can each day. You got this!